UAE rugby performance manager Apollo Perelini has high expectations for his squad ahead of the Test series in Uzbekistan next month. The former dual code Samoa international is into his second week of training with the squad ahead of the Asia Rugby Championship (ARC) series and has praised his players’ commitment. The 46-year-old has been focusing on skill levels in his initial sessions and is adamant all players need to be on par with one another. “It doesn’t matter whether you’re a front rower, second rower, a winger or fly-half, you all have the same responsibility. You all want to have the same skill level across the park,” said Perelini. Perelini’s UAE will warm up for ARC Division II games against Singapore, Guam and Uzbekistan in May with a friendly against a UAE Premiership Barbarians team, coached by Dubai Exiles’ Jacques Benade, at the end of this month. With early focus on skills, Perelini insists the pieces will all form together to make a complete picture in time for the ARC. “At the moment we haven’t run any team plays, no positional specifics, I’ve just trained them as rugby players,” added Perelini. 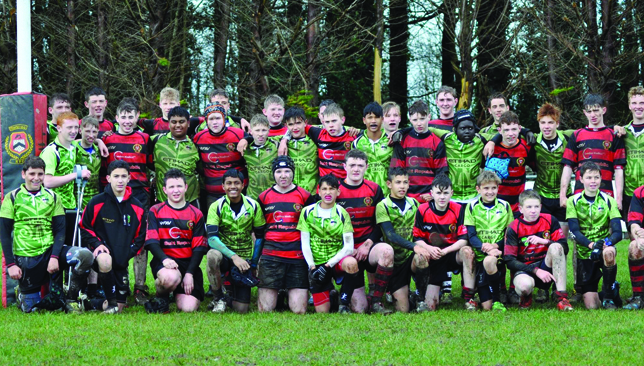 Abu Dhabi Harlequins U-14 (green) beat Monivea 24-19. It was mission very much accomplished for an exciting young Abu Dhabi Harlequins Under-14s side, who have returned to the UAE with four wins out of five on their testing tour of Ireland. Ahead of the March tour, Quins had spoken of their desire to prove that rugby in the Emirates is thriving and they would have left their hosts in no doubt as to its strength following some big wins. The visit to the Emerald Isle coincided with the country’s 100-year commemoration of the Easter uprisings, with Quins certainly giving themselves a gruelling schedule as they packed five games into their seven-day visit. Their opening match was a shock to the system for the Quins youngsters, who are accustomed to growing up in the desert and playing in near-perfect sunshine for much of the year. It turned out to be a very tough and muddy opening encounter against an U-15 side from Monivea, near Galway. Despite going behind, John Walsh’s side fought back, coming from two tries down to seal a thrilling 24-19 win. The game was played in wet and windy conditions, with Quins overcoming a bigger and older Monivea side that are currently top of their club league in the province of Connaught. After watching Connaught beat Leinster narrowly in the Pro12 tournament, Quins moved on to Ballina, where they played two matches – against the hosts, and another against nearby Ballinrobe. They registered comfortable and identical wins of 29-0. The UAE side were clearly starting to find their groove as the tour, which was sponsored by Etihad Cargo and power engineering firm ABB, headed to the capital, Dublin. Quins played two matches in Dublin, scoring three tries in a 50-19 defeat against a Seapoint team that contained several older players. But the boys signed off in style with a 49-0 triumph over Suttonians, scoring nine tries in the process. “There was a real festive feel about the whole tour and the lads thoroughly enjoyed every minute, on the pitch, and off it. The hospitality was excellent everywhere we went,” said Quins U-14 captain Milo Bly, who led the team from the sideline after unfortunately being ruled out by an injury on the eve of the tour. It was excellent preparation for Quins who meet Dubai Exiles on Friday to defend their UAE RA League title. Speed and skill: Tom Stapley. It’s been a whirlwind 2015-16 season for the exciting teenager who has not put a foot out of place since making his senior debut for the club just a few months ago, when he was still only 17. 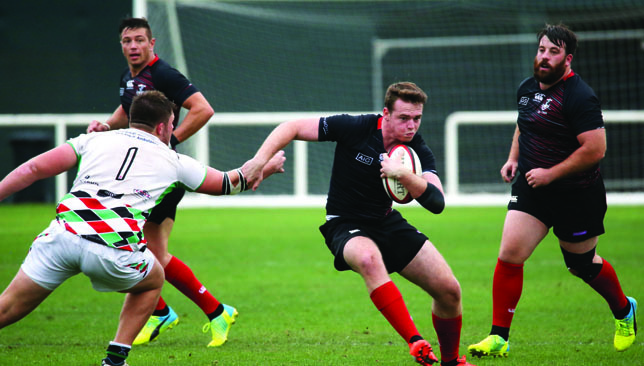 The strapping 6 feet 2 inch Stapley was born and grew up in the UAE but is now preparing to leave home behind for the Emerald Isle and a shot at professional rugby. He has already been to Ulster on a week-long trial earlier this year but has been invited back for a two-month stint which will include pre-season in July and August. Some of Ireland’s most famous players have worn the jersey, including Tommy Bowe, Rory Best, David Humphreys and Willie John McBride, and Stapley insists he’ll put everything into his chance. “It’s very exciting…a chance for me to really go and prove myself as a player,” said the teen. “It’s a chance to show my game somewhere else and really push myself and my game to the best it can possibly be. I was there for a week in February and had tips from the coaches what to work on. It’s good I’ve been invited back so I must have done something right. Ulster, who compete in the Pro 12 and European Rugby Champions Cup, were tipped off about Stapley’s talent by Exiles director of rugby Jacques Benade, who enjoyed a stellar 15-year coaching career in Ireland before his move to the Emirates last July. Stapley first represented Exiles as a six-year-old and says he owes his boyhood club a huge debt. Stapley signed off for now in perfect fashion with a hat-trick in Exiles’ 83-19 romp over Al Ain Amblers on Friday as the club claimed the double of UAE Premiership and West Asia Championship titles in 2015-16. Rugby, let alone winning silverware, wasn’t even on his mind at the start of the season. Stapley did not feature for Exiles until January as he had exams to concentrate on at Jumeirah College. “I didn’t think I’d have had as much of an impact as I have at the start of the season,” he admitted.